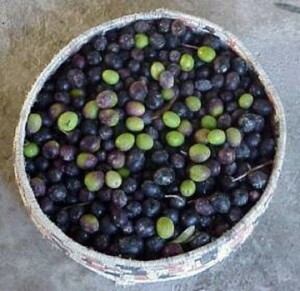 In a big bowl, cover the olives with water and set aside for 5 days. Replace the water with fresh ones and repeat twice (totally of 15 days in fresh water, changed every 5 days). For the next 7 days, change the water daily as mentioned above. Put the olives in a pot and cover with water. Drain the water into a bowl and salt them to 10%. Put the olives in a pot. Purr water and all other ingredients on the olives. Cook to boil. As soon as it stars boiling, take off immediately from the fire and let cool. Store olives and marinate in a big jar with a sealed lid. If liquids do not cover the olives, add fresh water to cover. Set aside for at least 30 days.